The college basketball season is upon us, which means Bo Ryan’s Wisconsin team once again figures to finish in the top 4 of the Big Ten and make the NCAA tournament. The bad news - the Badgers have to replace all three starting front court players and only return two post players that averaged more than ten minutes a game. The good news - they return four guards that have starting experience in a Wisconsin uniform, oh let’s not forget Sam Dekker, but more on him later. For the most part the eight man rotation is set. F Frank Kaminsky, F Sam Dekker, G Josh Gasser, G Ben Brust and G Traevon Jackson will start. G George Marshall, F Duje Dukan and F Zach Bohannon will start out as the first options off the bench. However, a couple freshmen, F Nigel Hayes and G Bronson Koenig, will make their case for more playing time as the season progresses. In fact, let’s break down the roster. Each player will be projected into one of the following categories. Redshirts - these players have either announced a redshirt year or could benefit from a year of development in the program. Bench Mob – these players figure to play sparingly. Perhaps someone push for playing time as eight or ninth option in the rotation. Wildcards – freshman who are talented enough to play right away if they can be trusted, could be surpassed by one of the bench mob. Starting Level Role Players – solid players that due to team needs can/should contribute one or two specific attributes. Running Mates – high level players capable of carrying the team on some nights and in favorable matchups. Jordan Smith – Guard depth will allow Smith to take a year of development in hopes he can contribute more as a redshirt senior than this year. Zak Showalter – Same story, loaded guard position this season, will be able to see the floor more as a redshirt junior or senior. Jordan Hill – Despite no big time college offers out of high school Hill has shown during Canada trip and exhibitions he definitely belongs on this level. Quick feet and aggressive defense means he will be a mainstay in the rotation sometime during his time at Wisconsin. Guard depth and age (won’t turn 19 until December) means he could benefit from another year with the team and not use eligibility. Riley Dearring – More of the same, guard depth is the biggest reason for him redshirt. Dearing will be a solid contributor and rotational player in 2-3 years. He has nice length and a very good outside shot. Dearring will definitely benefit from a year in strength program to add quickness and explosiveness. Evan Anderson – Hard to see him on the floor consistently in meaningful action unless there is significant foul trouble along the front court. Zach Bohannon – A solid player who can be counted on in spurts to play solid defense and play within the offense. He will need to hold off Vitto Brown for playing time as the fifth forward in the rotation. He has earned the coaches trust with his high basketball IQ, he is rarely out of position. However he will be challenged to consistently score on offense against strong and quicker players. Vitto Brown – Very talented defensively and will use that advantage for playing time in games when the Badgers need more muscle on the board and in post defense. Bo Ryan rarely uses more than eight guys in a consistent rotation and right now Brown is probably running ninth. Will need to show during the non-conference slate he can be counted on in order to get more playing time against Big Ten competition. Duje Dukan – Redshirted year last year and improved his confidence and assertiveness on the offensive end. During the Canada trip, Dukan averaged 8.8 points a game good for fifth highest production on the team. Playing time will be heavily tied to his energy and effort on the defensive end where he will be asked to guard players with a sizable weight and strength advantage. Will start as the first forward off the bench, but could lose that role to Hayes or Brown as the season progresses. Nigel Hayes – During the Canada trip in August, Hayes didn’t play much and looked every bit like a freshman experiencing his first major college basketball action. In the exhibition game against UW-Platteville, Hayes displayed a knack for offensive rebounding and tallied an efficient 8 points on 4-7 shooting in 14 minutes. He also impressed in a combined practice (closed door scrimmage) against DePaul. Hayes pushing for playing time over Dukan and Bohannon is a best case scenario and will translate to a more complete and versatile team. A lot is riding on Hayes this year. Bronson Koenig – Probably the most college ready player of the freshman. It speaks to Koenig’s talent that he can compete for playing time with all the guard depth. The Badgers will frequently be using three and perhaps four guard lineups. Koenig is comfortable at either guard spot and will not be overwhelmed by the level of competition. He is always in control and excels and running the offense and seeing the floor. If Koenig progresses as expected he will keep the guard rotation with fresher legs, especially as Gasser works back from ACL surgery. Josh Gasser – Aside from the freshman, Gasser is the biggest unknown entering the year. When the season starts he will be just over a year removed from tearing his ACL. How close is he to the player that held Vanderbilt’s John Jenkins to his worst shooting performance (13 points on 3-13 shooting, 20 ppg on the season) in the 2012 NCAA tournament? Gasser is an outstanding and versatile defender when healthy. His ability to guard opposing team’s small forwards will determine how successful the Badgers can be using three or even four guard lineups. Gasser also has amazing court presence and is an outstanding rebounder for a guard. Badgers will need their guards to pick up some of the rebound void left by Evans, Bruiser and Berggren. Expect Gasser to lead the way. George Marshall – Marshall finished last year with the team’s third best 3-point shooting percentage and really established himself as spot up shooter. As he makes the leap from redshirt freshman to sophomore, Marshall will be expected to contribute more than long distance shooting. Last year he had a tendency to play too fast and let his game spin out of control. With another year under his belt, Marshall can focus that energy and provide a nice change of pace off the bench. Traevon Jackson – Last year was a huge growing up season for Traevon Jackson. He had three different game tying or winning shots but was also good for one extremely lazy turnover and one heated argument with a teammate or official per game. By his own account the biggest thing he worked on to improve his game during the offseason was his maturity. He has earned and cemented his place at the point guard of the team. Expect to see a lot of games similar to the exhibition against Platteville: 7 assists, 1 turnover and a Badger victory. The Badgers do not need Trae to shoulder the scoring burden every night, but having a player with the big shot chops out on the court every night is a luxury few teams have. Ben Brust – Continues the outstanding tradition of guard development under the tutelage of Bo Ryan. Brust is an accomplished shooter and can get hot and change a game in a hurry. He has made 6 or more 3 pointer three different games. He also is responsible for one of the more iconic shots in Badger history. But he is more than a shooter. Brust has improved in every facet of the game each year since arriving in Madison. He provides above average perimeter defense and rebounding for his position. It will not be unusual to see Brust lead the team in scoring, however, his energy and leadership (1 of 2 seniors on the roster) will be needed most this year. Frank Kaminsky - Perhaps no other player on the roster enters this season with as much pressure as Kaminsky. Listed at 7’ (just the 5th 7-footer in program history) he will be shoulder a bulk of the defense and rebounding void left by Berggren, Evans and Bruesewitz. The good news is Kaminsky displayed an assertive offensive game in Canada averaging 15.6 points. His long range shooting (over 30% from 3 point range) stretches the defense and opens up lanes for the guards to drive. The bad news is Frank averaged just 2 rebounds a game last year. Kaminsky will need to rebound at a rate befitting a 7-footer. If Ben Brust is the leading rebounder on the season, it is going to be a long year. Sam Dekker – Bear with me. I promise not to make this Ode to Dekker too long and glowing, but make no mistake, he is going to be really, REALLY good. During the team’s annual preseason media day, Bo Ryan offered up this tidbit on Dekker “He’s in the process of really tinkering with being pretty special”. Dekker played 22 minutes a game even with three senior front court players in the starting lineup and eventually found his role as “instant offense” off the bench. There were moments though, like the 10 straight points against Indiana in the Big Ten Conference Tournament Semi Finals where Dekker hinted it was only a matter of time for him to break out as one the conference’s elite players. During the Canada trip, Dekker averaged 19.4 points, 8.2 rebounds and 3.6 assists per game. As impressive as those numbers are, seeing him in action provided more context on how he controlled play and raised his game at the end. Early on, Dekker played within the offense and didn’t force anything. But with the game on the line in the second half, he took over. Devin Harris was the best I’ve seen in a Badger uniform and he was wired the same way. Run the swing offense, assess the other team early and in crunch time, take over. 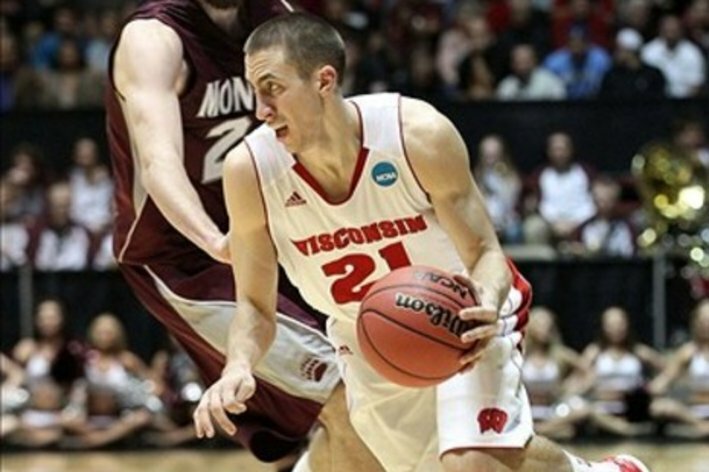 Thus far Dekker has handled the increased pressure of being the go-to scorer and leader. He’s been more vocal in practice and knows other players are following his lead. Yet when asked what has changed now that this as “his team”, Dekker responded “It should never be anyone’s team. It’s Coach Ryan’s team. This is the University of Wisconsin’s team”. And that quote tells you all you need to know about Sam Dekker.